Graffiti Art. Live, Custom Urban Art. This unconventional, impactful form of entertainment will not only amaze your guests, but will transform its surrounding space giving your event an urban touch of art and excitement. Presented as a main attraction, accompaniment or interval spectacle, your guests will be impressed as they witness the creative process of the art of graffiti from beginning to end. A free standing work of art created by a well-respected graffiti artist will be tailored to your unique specifications to adapt to the concept of your event. With our ‘Graffiti Art’ your memories can live on by immortalizing your affair through a work of art reflective of the success of your event. Understanding our client’s vision and executing is where we excel as our exclusive graffiti artist has an extensive background in visual design for corporate communications. Together we can collaborate to strategically create an urban art experience that effectively delivers a powerful brand message. These masterpieces cannot be complete without a signature, or many in this case. 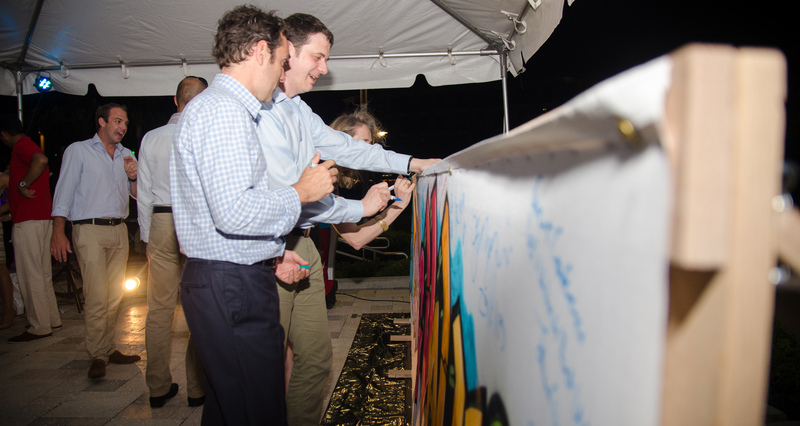 At the end of the event, all guests are invited to sign their names on the canvas, leaving their mark on a memorable experience. Create a vibe to intrigue your guests, bring Graffiti Art to your next meeting or event by calling us today (800)606-5134.